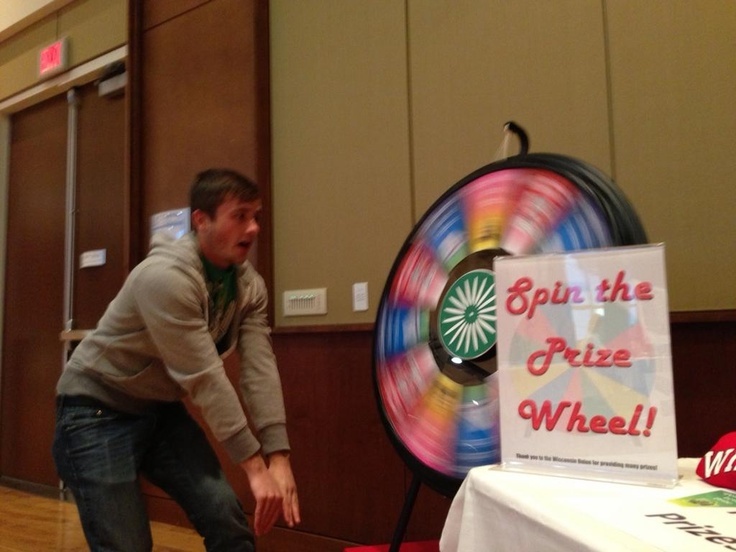 Prize Wheels are popular attractions for many college events. 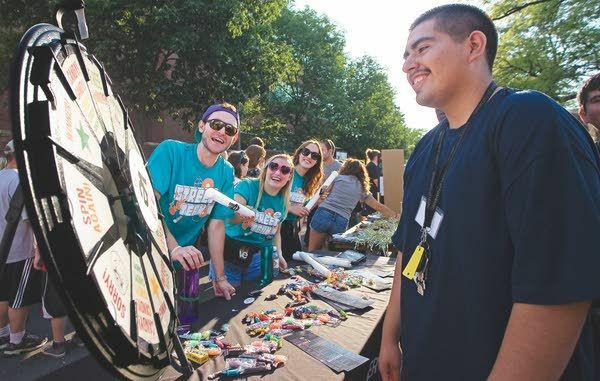 Whether welcoming students back for the new semester, sorority and fraternity social events, university fundraisers or alumni activities, the Prize Wheel is a fun and interactive way to draw a crowd. Consider giveaways imprinted with your university logo. Even better, have the mascot from your football team on hand to take part in the fun. 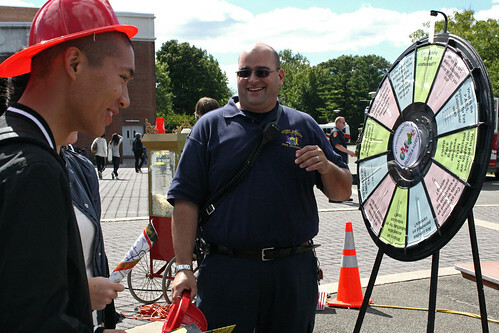 Set up the Prize Wheel in the quad of the university and watch students and faculty line up for their turn to win. CP Federal Credit Union uses a variety of tools, including the Prize Wheel, to teach students about money. Play coins are given to spinners who must count the correct amount of change in order to win a prize. It’s very important to start early and start young. Our savings programs don’t revolve around a dollar amount. What we want is to establish the habit of saving. You can read more about teaching students to manage money here. The Prize Wheel isn’t just for prizes. 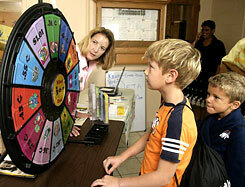 Many customers use the Prize Wheel as an educational tool… inside and outside of the classroom. Questions can be added to the front of the Prize Wheel. And since each of the slots on the Wheel can be easily replaced with new questions, you can keep the game fresh. Use the Prize Wheel to engage students. The Prize Wheel can educate and inform. 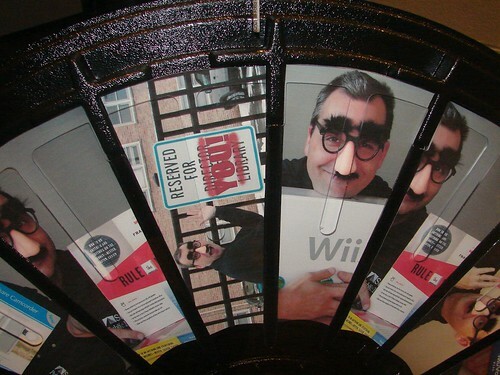 The Skokie Public Library did an amazing job customizing the 18-Slot Tabletop Prize Wheel with photos taken for their “10 Things” program. Photos were taken of the program’s masked mascot with each of the prizes that were available. Everyone who completed the 10 Things program had a ticket in a briefcase. Tickets were pulled at random and the person got to spin the wheel to win something. You’ve probably already discovered that the Prize Wheel is a great tool for trade shows, business openings and in-store promotions but how about birthday parties? Human Resources: Foster goodwill with your employees by creating a customized Prize Wheel to celebrate each employee’s special day. Children’s Birthday Parties: The Prize Wheel is great for your business, but it can also be used for personal parties and events. 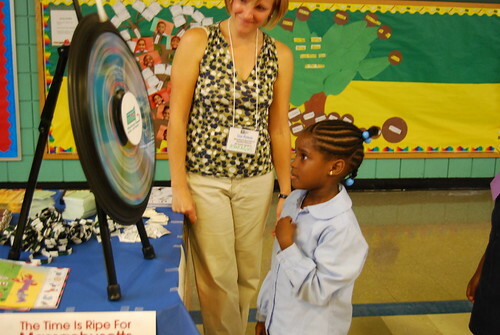 Kids love to spin the Wheel, too! 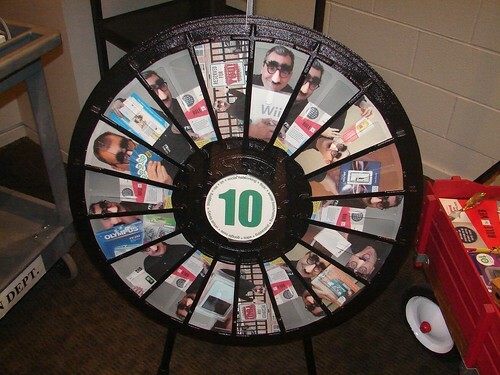 Event Planners: The Prize Wheel can be a great game for the next birthday party you are in charge of coordinating. You can download a free balloon layout for your standard 12-Slot Prize Wheel by clicking the image above or by clicking here. This PDF file may be opened with Adobe Acrobat Reader. You may also customize the design with many image editing and design programs, including Adobe Photoshop and Adobe Illustrator. This layout can be used with the 12-Slot Prize Wheel (Floor or Tabletop) and the 12 to 24 Slot Adaptable Prize Wheel (Floor or Tabletop).